Time is running fast and soon we will be celebrating the opening ceremony of the London 2012 Olympics. 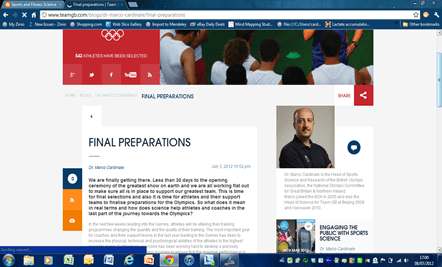 Here is my latest blog on the Team GB website. 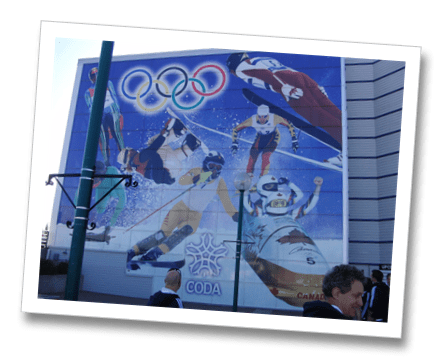 The Olympic Winter Games are starting in few days and athletes are finalising their preparations for Vancouver. I will be there with Team GB in my second Olympic Game after the exciting Beijing Olympics. In the last 3 years we have spent a lot of time helping and supporting our winter sports athletes to help them prepare in the best possible way for Vancouver. We are not alone of course. Many countries are investing large sums to gain edges in all areas of preparation. Winter sports rely a lot on a variety of equipment for training and competition and in the race for success scientists from all over the World are looking at innovative technologies to give an edge to their athletes. Team Canada has set the target to finish first in the medal table at their home games and to accomplish this dream has invested $ 8 millions in a programme with 55 top secret projects. Strangely enough, despite naming the project “Top Secret”, the Canadians are adamant to talk about it. Of course they are proud of the wonderful job which has been done and are not afraid to talk about it. Top Secret had two components. One dealt with the hardware of boots, skis, skates, poles, helmets and suits. The other focused on human physiology. In particular, a lot of work has been apparently done on recovery modalities. We have done our work as well and hope to create few upsets in Canada. Preparation and travel plans are the first priority as our athletes will be competing in another continent. So plans to cope with jet lag and speed up adjustment to the new time zone have been put in place as well as recovery strategies to reduce the effects of sitting on a plane for hours. We have organised holding camps in Calgary and Lake Placid to provide our athletes with the best environment to prepare for the games. Science and technology projects have been conducted with various sports on equipment development, innovative training, preparation strategies and recovery modalities in partnership with our colleagues at UK Sport and at the Scottish and English Institutes of Sport. Last but not least a great partnership with Adidas means we could provide our athletes with innovative clothing solutions. So, we have our own cards to play and are looking forward to the next few weeks. Recovery seems to be an hot issue and every country is looking at optimising recovery strategies for athletes competing over few days during the Olympics. Competition preparation and recovery are possibly the key areas where significant gains can be obtained. Physical and technological preparation is carried out for 4 years, but it is the little detail in the last few days which can make a significant difference for athletes on the big day. Little details like what they drink, what they eat before their competition, the timing of food and special drinks intake, how they warm up, and most of all in what physical and mental state they are when standing on the start line. Of course technology plays a big role, equipment can make a difference, but the winner is always the athlete as no equipment can win on its own! The last few weeks have been quite hectic. Team GB has received a lot of media attention following the press conference organised to present our preparation plans.